Five String Progress #11: Back Plate completed and installed. The inside arching took a lot of time and energy, but it is just part of the job. Once it begins to get closer to completion it is a lot more encouraging, but initially, it is just a lot of work. Beginning the inside arching of the back plate. Back inside arching in progress. I made those wooden handles for my Ibex planes so I would not blister my fingers using the planes. 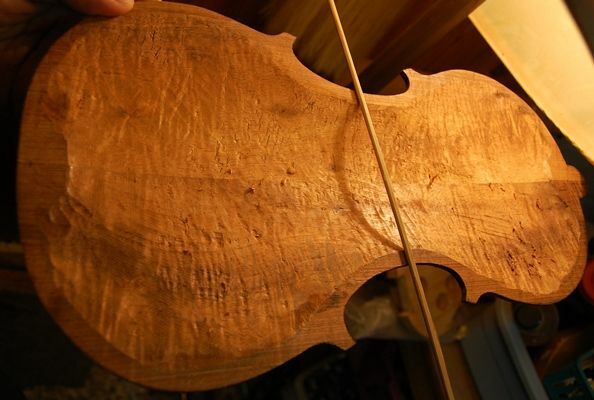 Here, you can see the curvature of the plate, but you can also see why I have to stop using the planes, relatively early, and revert to scrapers: the curly wood tears out badly under the plane. 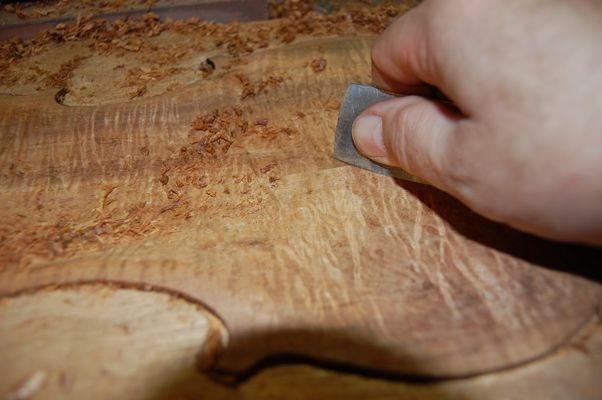 I also have to measure the thickness over and over, using a graduation caliper, so as not to cut too deeply. This process is called “graduation”, I suppose, because the thicknesses have to gradually change from area to area. They are not entirely symmetrical, but there is a general plan and some practical limitations. Scrapers cut very smoothly, and usually without any tear-out. You can make the scrapers any shape you want, but you have to keep them sharp. 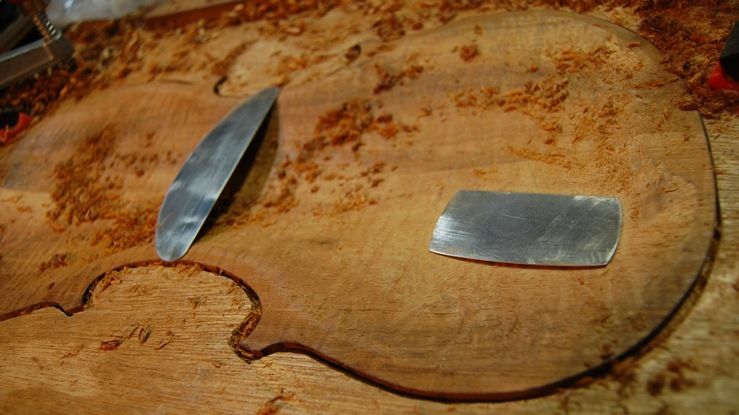 Scraping can be hard on the hands: some people make handles for them. I haven’t done that yet. My thumbs get pretty tired, though. I almost forgot to take pictures! At this point the plate is complete, except for purfling. In the past, I have always installed the purfling before attaching the plates to the corpus, but on this instrument I decided to try purfling after plate installation. I think I like it. I have better control of my edge over-hang in terms of both size and shape. So: the inside edgework has been done, the label is installed, and the plate is ready to be glued in place. Back plate ready to install. What I do, nowadays, is to carefully dry-fit the plate to the garland so that it is exactly the way I want it, clamping securely over all the blocks (about eight clamps in all). Then I remove a couple of clamps at a time and slip hot hide glue into the joint, wipe it down with a rag and hot water, and re-clamp that area, adding as many clamps as will fit. I work my way all the way around the plate, and never have to hurry, or suffer any fear that something will get out of alignment while I am working. 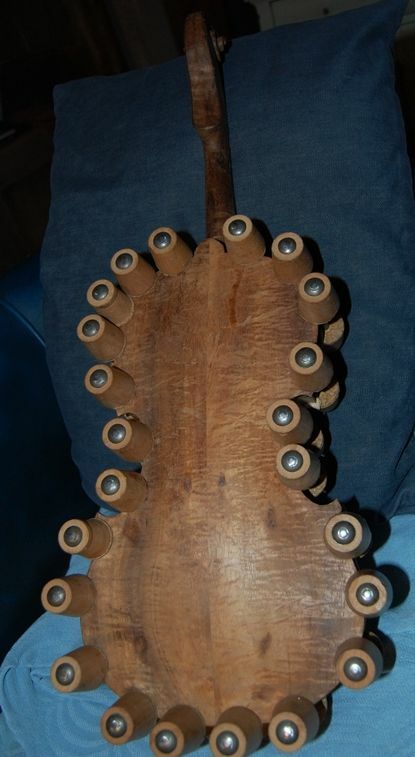 For the first four of five instruments I made, I would apply glue all the way around the garland then engage in a panicky race to get the plate aligned and all the clamps in place before the glue gelled. Not good. Usually, about that time, the phone would ring, too… (sigh…). This way is very peaceful, by comparison, but I have learned to be less compulsive about answering the phone while gluing, too. Back plate secured with hide glue and spool clamps. 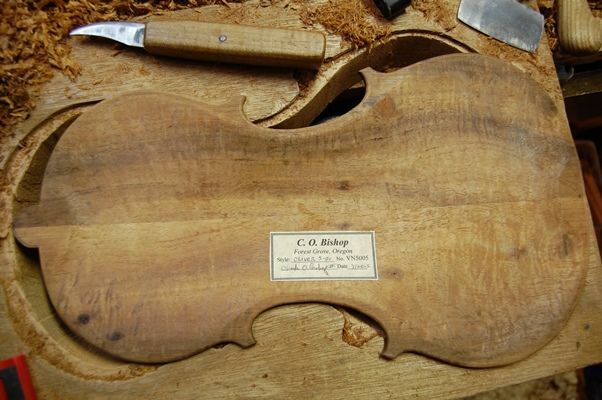 Once the glue is dry, I will be ready to begin purfling the back plate. I really enjoy and appreciate the information and photo’s that you share on Linked-in ! When you are gluing up the back how many clamps do you take off at a time to apply the hide glue ? 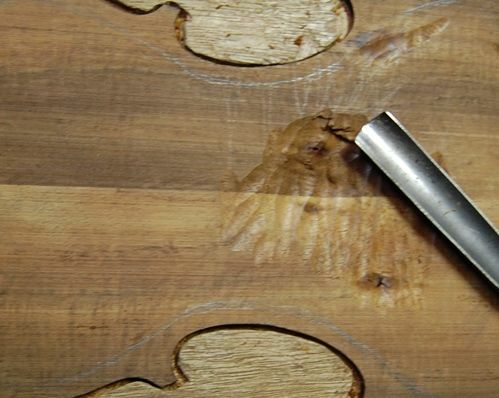 The initial fitup involves (usually) two clamps on the upper and lower (neck and end) blocks, and one at each of the corners. So, usually, I would remove, (for example) the two at the end block, and carefully, thoroughly glue the end-block area and as far out along both lower bouts as the palette knife will comfortably slide, without forcing it; rubbing back and forth to distribute the glue. Then I replace those two clamps and add more, along both lower bouts, to fill in, so that the whole lower bout is secure. Then I choose a side, and remove both corner block clamps and maybe the first two on the lower bout; glue both corner blocks just as I did the end block, and rub glue overlapping my previous glue on the lower bout, as well as up into the upper bout as far as I can go comfortably. Then I re-clamp the corner blocks, and add as many clamps as will fit. I do the other side next, and the neck block last, if we are talking about the back plate, as on this post. 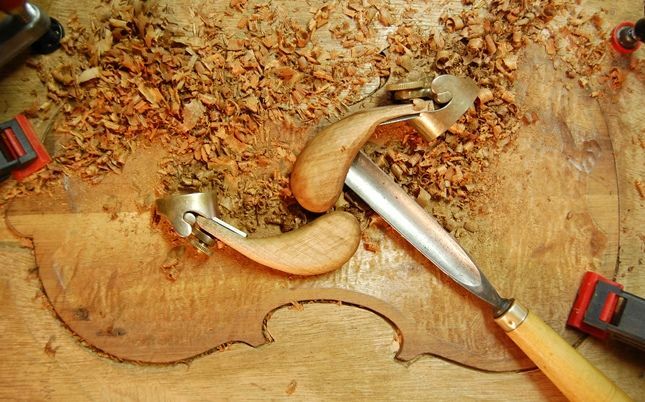 The reason I do the neck block last is that I will need an adjustable F-clamp (or a large spring clamp) on the neck heel (not shown in this post…I forgot it momentarily); and, besides, I want one last chance to adjust the neck angle a little if needed. So I remove the clamps on both sides of the neck, slip the glue into the whole neck/heel area, as well as out along both upper bouts, and clamp it solidly again, double-checking the angle of the neck as I do so. The whole process takes maybe 15 minutes.